MS and Vertigo: Are Vertigo and Dizziness Symptoms of MS? Are Vertigo and Dizziness Symptoms of MS? MS and Vertigo: Is Vertigo a Symptom of MS? Vertigo affects approximately one out of five people who have multiple sclerosis (MS). While vertigo most often comes and goes, some people who have MS experience vertigo or dizziness much of the time. Dizziness feels quite different than vertigo. It is a sensation of lightheadedness and faintness, and you may feel weak and nauseous. Dizziness is a sensation you may feel if you rise out of bed too quickly — a sensation of feeling like you are going to faint. 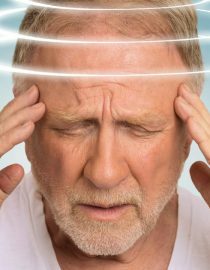 Dizziness is often transient, lasting only for several seconds; however, it may be persistent depending upon the underlying cause. It may be due to low blood pressure, certain illnesses or medication. Vertigo is a spinning sensation that may make you feel imbalanced, often accompanied by nausea. The floor beneath you may seem like it is moving or rising up. Vertigo is usually recurrent and can be persistent — it may take months to resolve or become permanent. It often flares up when other MS symptoms are poorly controlled and during times of illness. It is usually due to sensory issues within the inner ear, however, changes in the nerves and brain also create vertigo. Dizziness and vertigo are managed by a wide array of means. Both are unsettling and may cause you to feel anxious. Staying safe from falls and other accidents is of primary importance whenever vertigo or dizziness are present. Vertigo may be related to MS or may occur due to other causes. The most common cause is benign paroxysmal positioning vertigo, also known as BPPV. Vertigo is less common due to the development of a new lesion or a flare-up of a current one. Lesions within the middle part of the brain are more likely to cause vertigo than lesions to other areas of the brain. Sometimes vertigo results from nerve damage to the eighth cranial nerve, which originates in the base of the brain, known as the brainstem. The eighth cranial nerve is the nerve involved with maintaining balance mechanisms within your inner ear. Medications used to treat MS and other illnesses may also cause vertigo. Drugs used to manage anxiety, depression and spasticity are common offenders. Blood pressure, seizure, heart and diabetes medications may precipitate vertigo too. Vertigo may be completely unrelated to MS. You may experience vertigo if you are ill with an infection, such as influenza or an ear infection. In rare cases, vertigo is due to a tumor within the inner ear. MS migraines are sometimes accompanied by vertigo. Meniere’s disease is a relatively common condition characterized by vertigo. Vertigo is sometimes a sign of a stroke or transient ischemic attack, also known as TIA or mini-stroke. If you think you are having a stroke, call 911 immediately. Diagnosis and treatment of vertigo can be challenging because so many mechanisms are involved with your body’s ability to maintain equilibrium. Nerves from your brain, eyes and inner ear and other sensory pathways impact the occurrence, diagnosis and treatment of vertigo. If you have visual problems or mobility issues, treatment and diagnosis may be more complicated. Notify your healthcare provider if you experience symptoms of vertigo. It is important to get a complete physical exam so all potential causes of vertigo may be considered. Review your current medications with your physician or pharmacist so you can make sure they are not contributing to or responsible for your distress. Next page: possible complications due to vertigo.